← Innovation – Where Should You Invest? Often innovation is about making unexpected connections. A diverse network of contacts increases our chances of making these connections. Your network is a great asset in expanding your thinking, providing new inputs and generating novel solutions. How Many Relationships Can We Sustain? In 1992 the anthropologist Robin Dunbar analysed social groups in primates and humans and concluded that number of people we can maintain stable social relationships with is 150. You’ll see this number widely quoted (and mis-quoted) on the internet, for example ‘Everybody has 150 friends’. Dunbar’s work was more subtle than that. Dunbar said we have a series of embedded relationships. 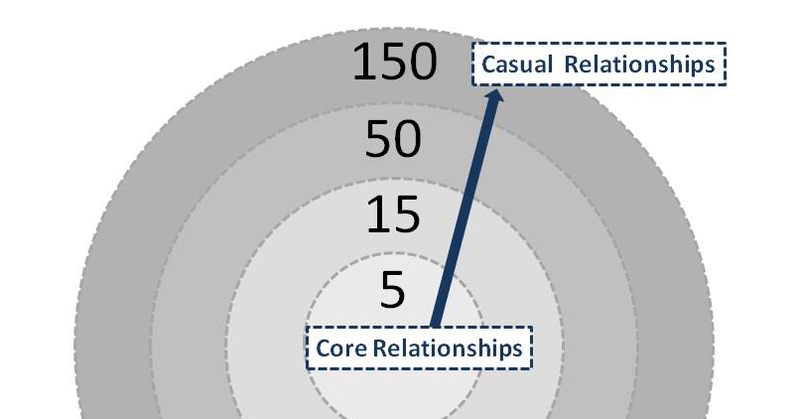 We have an inner core of very close relationships, typically about 5 people. Our network expands out (in multiples of three according to Dunbar) to an outer layer of people we recognise but have only a casual relationship with. Your network, including casual online acquaintances, is bigger than you first imagined. Think of your real world friends, Facebook friends and LinkedIn contacts. Add in your work and personal email contacts. Include all activities that have a social element. For example, you can build a network of contacts in a sports club or online while you’re sharing photos in Flickr. Web 2.0, mobile and social technology has allowed us to extend our relationships beyond Dunbar’s number. Pew Internet Research found the average American internet user has 669 social ties. Yes, many of these connections are ‘loose’ connections. We may not contact them regularly and we may not invest a lot of time in the relationship. Yet they are connections. We have something in common with these people. The something that brought us together in the first place. I see the power of loose connections frequently. I’ll share one example. We ran an idea generation workshop to identify novel methods of measuring drug delivery to the brain. (It’s very difficult to do: you can’t take someone’s brain out, measure the amount of drug in it, then put their brain back). A total of 100 people in ten different teams worked on the challenge for one week. Most of the participants were biologists, neurobiologists or medics. One biologist invited his friend who was a physics graduate. She invited some of her friends who were also physicists, who invited some of their friends who were mathematicians. Together they formed a team to tackle the challenge. developed mathematical algorithms to show how the data could be analysed to measure the amount of drug that was in the brain. By combining their knowledge from different areas of expertise they were able to make new connections and develop solutions to the problem that were both novel and useable. Do you deliberately connect to people who are different from you? This entry was posted in Collaboration, Innovation, Open Innovation, Social Media and tagged collaboration, connection, innovation, network, open innovation, participation, social. Bookmark the permalink. Interesting. It reminds me of the book, ‘The Shift’ in which Lynda Gratton writes about the ‘regenerative community’ (those who you socialise with, who are important to your well-being); ‘the posse’ (a small group, many similar to you, easily reached, known to you for some time, who add value); the ‘big ideas crowd’ (wider network, all different, friend of a friend, many on social networking). That’s utterly amazing… and I’m just a little bit suspect of the average American online user having 669 social ties. I’ve got about 1 core relationship, and around 5 “acquaintances”… though I guess if you’re counting everyone I ever said “hi” to or exchanged cards with as a “loose connection”, and you’re counting all of these together and calling it “social ties”, then maybe that’s why its such a high number. More important than having connections though is the kind of connections you have. In your example, you used scientists as the loose connections. I think a similar example using regular people as loose connections would be more difficult to come by.